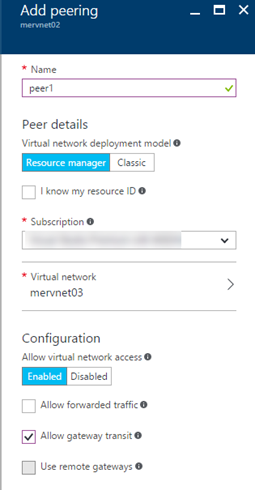 VNet Peering in Azure enables 2 VNets within the same region to be connected directly through the Azure backbone fabric network. Previously there was a requirement to use a VNet gateway and establish a VNet-VNet VPN connection. One of the major downsides to this was the requirement to enable to use a VNet Gateway which has bandwidth limits (depending on SKU) and additional network devices in the path will inevitably increase latency as well, regardless if the 2 VNets were in the same region. 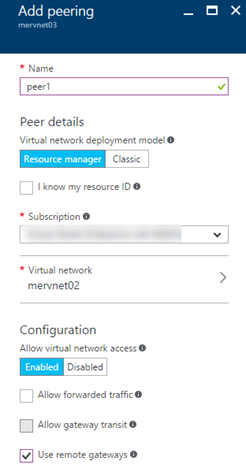 With VNet Peering you can now enable high bandwidth and low latency direct connections across VNets in the same region, you can also peer with VNets across subscriptions if both VNets are ARM based and both subscriptions are linked to the same Azure AD Tenant. If you peer an ARM Vnet with an ASM VNet then they must be within the same subscription, and it is not possible to peer 2 ASM VNets. In this blog we will use the Gateway Transit feature to provide connectivity from on-premises network through a Site-to-Site (S2S) VPN to a second VNet that is peered with the VNet that is connected to the S2S VPN. In this configuration the on-premises network and VNet 2 will have network connectivity via the Gateway Transit configured in the peering configuration in VNet 1. In the example shown in the diagram above, we have an S2S VPN connection established between an on-premises VPN device (in this case 2012 RRAS) and an Azure VNet using a VNet Gateway, and configured to allow gateway transit. The second VNet will be set up to peer with the first VNet, and configured to use the remote gateway. VNet Peering can be configured from https://portal.azure.com or via PowerShell. A peering requires a configuration on both sides of the peering relationship. Configure the Peering configuration on VNet1. VNet 1 is connected to the on-premises network and will be enabled for Gateway Transit. Select the VNet and Select Peerings, and +Add. In this example we are setting up peering across VNets in different subscriptions. The remote Virtual Network is the second VNet Resource ID. Since this is the first VNet where the S2S VPN is intiated we enable AllowGatewayTransit. If required update your network devices to add the new route to the second VNet. In this case there is a Windows Server 2012 R2 VM used to connect to the S2S VPN. That’s it after this is done you will have connectivity to the second VNet using the first VNet as Gateway Transit. When VNets are peered by default there will be unrestricted network access between the VNets. All traffic will be allowed by the VirtualNetwork default NSG Tag rule. 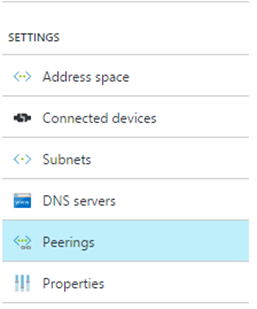 This can be overridden when you create the peering with the Add-AzureRmVirtualNetworkPeering –BlockVirtualNetworkAccess switch. When AllowVirtualNetworkAccess = False specified, all traffic will be blocked between the peered VNets. The VNets are still connected and peered, and you can create specific allow NSGs to enable the required traffic between the VNets. Important to note, this does not prevent access from the on-premises network. In this example AllowVirtualNetwork access has been disabled on VNet 2. 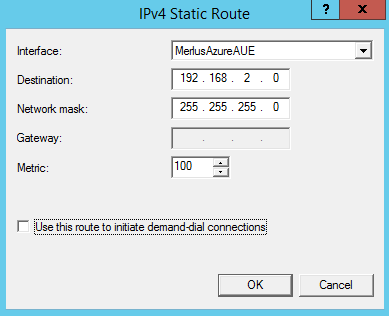 All traffic is still allowed by default from the on-premises network to VNet2 via the Gateway Transit.